TREASURED ENCOUNTERS: A Wild Announcement Day! Today is a most exciting day as it is 'Announcement Day!' How often does one get the chance to giveaway an autographed copy of a favorite, extraordinary story? 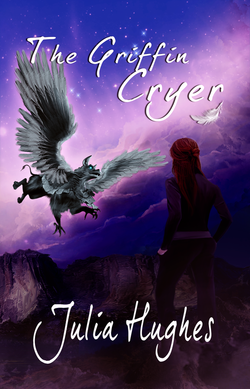 Julia Hughes' novel, 'The Griffin Cryer,' is a brilliant tale for young adults and also captivating for young-at-heart adults like me. And Julia is a most favorite author and has become a dear friend. So today was quite special! 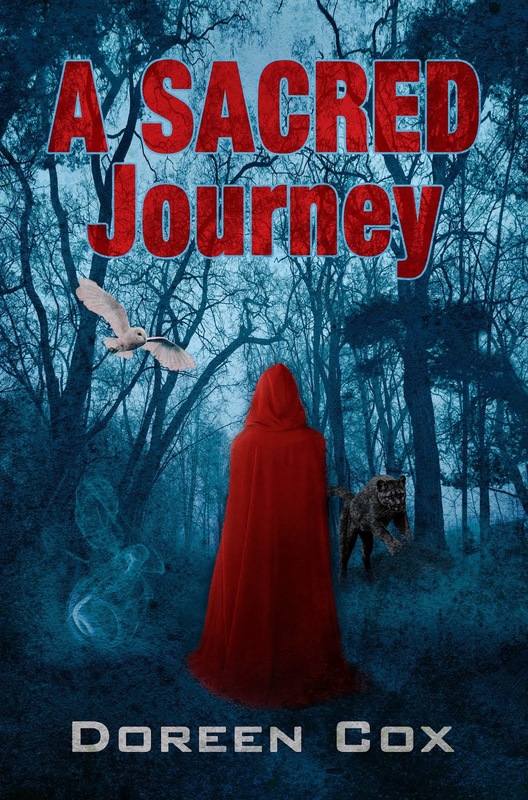 Thanks so much, Julia, for offering a free autographed copy of your fantastical tale! Luckily for me, I was not alone in this endeavor. My sister and 'fellow traveler' reader, Kathy, for some wild and crazy reason, agreed to join me in this Announcement Day dance with Andy. Andy waited patiently just out from the dock, close enough to ensure we were following his directions. 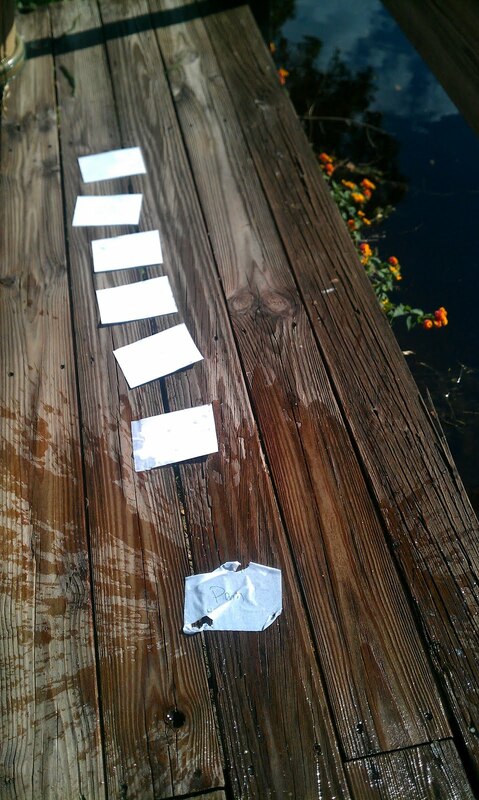 First, I read each entry's comment then we were tasked with laying out on the dock pieces of paper, with potential winner's names placed face down. It's a bit windy so Andy got a kick out of watching Kathy and I scramble around keeping the papers aligned. We stepped back just in time, too, as Andy slapped his tail so fast (I had no time to snap his picture) and splashed water onto the dock. His aim was amazing for only one piece of paper got drenched! 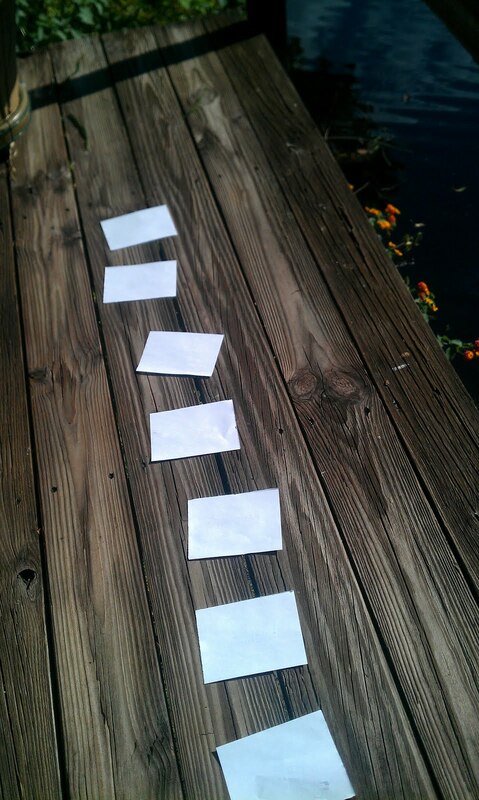 Kathy and I scrambled around, grabbing papers to keep them from flying off into the canal. Andy wasn't done with us, though. Our next task was to show the winner's name to Andy; he wouldn't take our word for it. Andy cruised down a bit towards the end of our dock where he has a special place to catch the sun. Kathy found a bit of fearlessness (from where it came, I don't know!) and.....well, look at the picture I snapped. "I really enjoyed reading your review of The Griffin Cryer, you have done an excellent job. I can honestly say that this would be the only book I would actually like to read. And you know me. I'm not a reader but you have made this seem so interesting. Thank you very much." 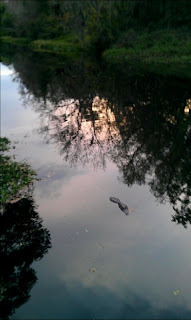 A note about alligators. They are very shy, not dangerous critters in the wild and even in lakes and ponds and rivers that are in populated areas. 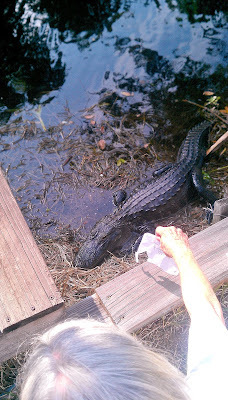 It is the feeding of gators by humans that becomes a death sentence for many of these amazing reptiles. In many cases, gators fed by humans become nuisances, seeing humans as food providers; they are usually put down. Andy was fed by a resident when he was very young yet the feeding was stopped just in time for him to be able to remain in our canal. He's a bit less shy than some, as you can see, yet remains shy enough to dart away if a human gets too close. I'm still shaking at your close encounter with Andy. 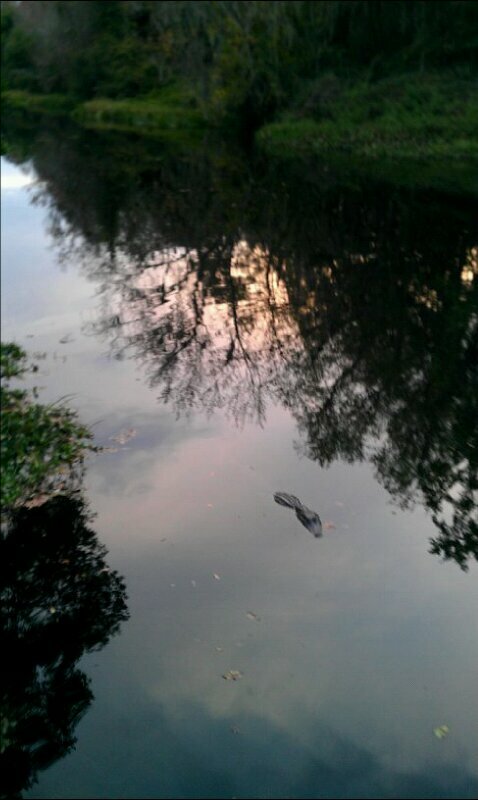 But very envious you have your own alligator as a neighbour. How serendipitous that he should show up. Are you sure you didn't whistle for him? 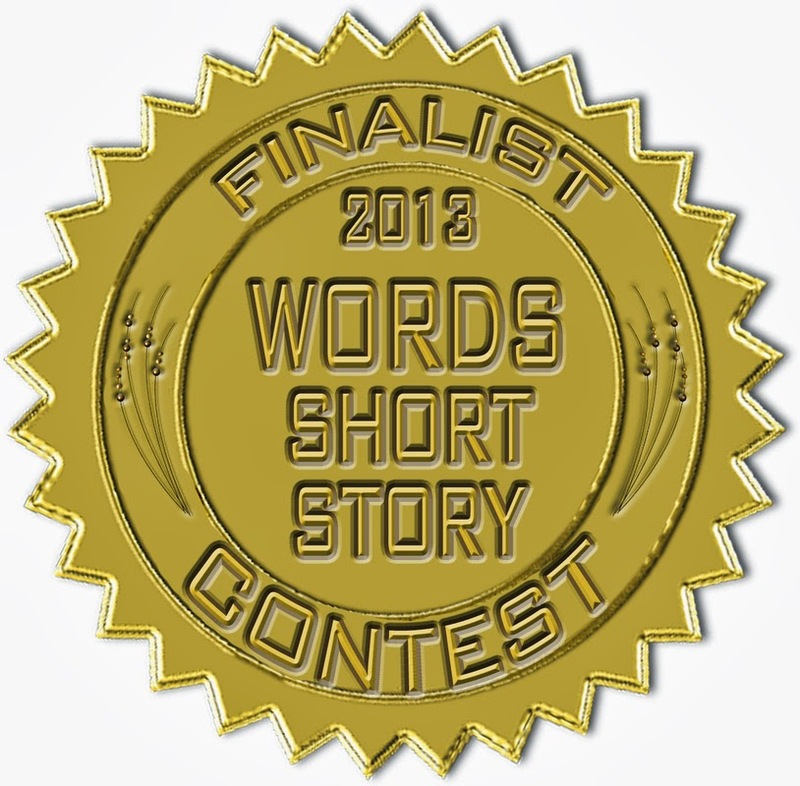 Congratulations to Pam:) Thank you Dody, and Thank you Kathy, & many thanks to all your readers for joining in the fun! I can breathe again now! You started the ball rolling this way, Julia...and no surprise with that wild imagination of yours! Wouldn't trade the entire experience for anything: from my first tweet with you, read of AET and each tale, the interviews, the beta reading of TGC and this, a very wild announcement day experience! How lucky can a gal get? LOLOLOL! My sister is typically the most adventuresome of the two of us, but I became intrigued at her plan to choose the winner for receiving a signed copy of Julia's book. 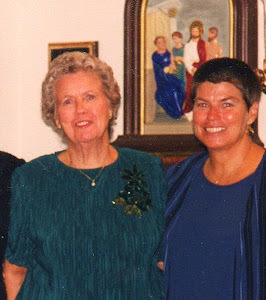 She and Julia have a most profound and zany friendship, as they support, amuse, and share in life's daily foibles, mishaps, and treasured moments. So, given all that, I arose from my comfy chair and joined her with our denizen of the deep, dark canal-Andy. Don't know what got into me as I gave nary a thought to holding out that little scrap of paper. Yegads, at least he didn't select my hand for his dinner, as he happily played his role in our little escapade! 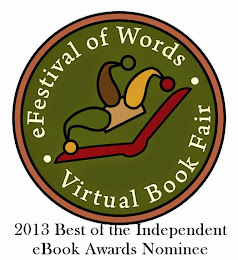 Congrats to my sister and her fellow bookmate, Julia Hughes! Cannot help but think, my dear sis Kathy, that your daring move reflects the current change made in your life's journey. Stepping out on the limb of adventure and change is a thrill, isn't it? Love you! I simply can't believe my eyes! This is going to go down in history as the most amazing prize draw ever and so truly appropriate to have Andy as your special guest in honor of Julie's other scaly friend Alfie. I would have loved to have been with you today, although I'm not nearly as brave as you two, I would have been watching from a safe distance with the first aid kit and phone to hand! Thank you for bringing us all such entertainment today, as always your beautiful spirit shines through and Andy is very lucky to have such wonderful human neighbours. Bet your mum was smiling down and having a right giggle at what her crazy girls were up too. WOW!!! Dody, you and your sis are fearless! I must agree with Charlie, nothing compare with an alligator drawing a winner! You reminded me that there's so much hidden beauty in this world of ours. Thank you for taking me back to a time when I could still be surprised and laugh in amusement. Grazie mille! *waving* to you, Monica, and to Nero, a much more adorable winner-drawer than Andy! Andy is not one to be petted, loved on; nor will he allow a leash :-)He is, however, an amazing critter who has often gotten a bad rap. Julia's niggles have certainly inspired her pals to become creative during TGC's freebie promo. It is certainly a pleasure to connect with you in the stream. Good tips on alligators Dody. keep them safe for the day we move to Florida. How old is Andy? Thanks for sending Julia over to say "hi" on my blog and comment. Dody: Life on a canal filled with wondrous creatures + a giveaway of a book filled with equally wondrous creatures -- what a perfect combination! That's some imagination you have. ;-D Of course,some would say griffins are much more wondrous, being fantastical and all, but gators have such a level of cool, I'm surprised they don't wear shades. ;-} Love the post! Fun & exciting!